(Nanowerk News) Many tumors spread: Single cancer cells migrate with blood flow through the body before they settle in new tissue. In this way, metastases may be formed, even after the main tumor was treated successfully. It is difficult to detect cancer cells in the blood at an early stage: About one malignant cell is encountered per billion of healthy cells. Researchers of Karlsruhe Institute of Technology and the Center for Nanotechnology (CeNTech), Münster, have now developed a clinical method to reliably detect and isolate single cancer cells in blood samples in cooperation with the University Hospital of Hamburg-Eppendorf (Scientific Reports, "A Versatile Microarray Platform for Capturing Rare Cells"). The number of extracted tumor cells allows conclusions to be drawn with respect to the success of therapy and the future course of the disease. Genetic analysis of cells allows therapies to be adapted to the type of cancer to be treated. Medical tests of patient blood samples were carried out by the team of Klaus Pantel of the University Hospital of Hamburg-Eppendorf. Moreover, the newly developed method can be transferred to all applications, where rare cells in blood or other body liquids have to be isolated. The main component of the new method is a microarray platform. By means of polymer pen lithography, a surface is provided with a microscopically small structure using a plastic die. The target cells adhere to these structures. The blood sample to be investigated is injected into a flat microchannel that crosses the platform. As a maximum number of target cells is to contact the array, a fishbone-shaped structure at the top of the channel stirs up the passing liquid. “While the tumor cells dock to the prepared locations according to the key-lock principle, the remaining cells are simply washed away,” Hirtz explains the principle. To prevent the arrays, i.e. the locks, from having to be exchanged for every application, the scientists provide all target cells with a general key: The biotin vitamin. In advance, this vitamin couples to the surface of the target cells via specific antibodies. “Our concept still is in the development phase and, hence, not fully optimized. Its sensitivity, however, partly exceeds that of known standard methods already. 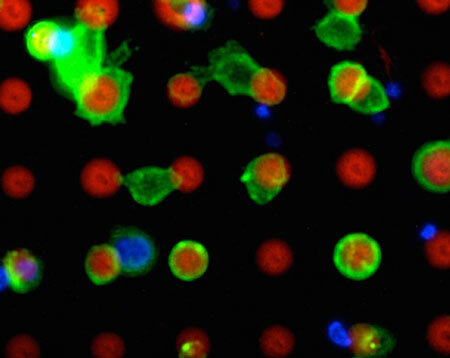 In addition, medical fine diagnosis of the cells is facilitated,” Harald Fuchs emphasizes. The researchers are now working on a prototype method that can be used at the hospital. For this, they receive funds from the European Research Council under the “Proof of Concept” program.